The SEMA show, the big aftermarket parts show is held in Las Vegas, Nevada in early November every year. The show exhibits many tuning cars and parts which are not only for the American cars, but also for imports that are popular in the US. The huge show has various categories such as tires, car audio, and so on. The only difference between the Japanese Auto Salon and the SEMA Show is that the SEMA Show is open only for the manufacturers and not to the general public. With plenty of vendors, 4 days might not be enough to go through all of them. Yas, our cameraman residing in the US and Mr. Nakaarai, a wandering mechanic, attempt to cover this gigantic event. Don't mind the small details as these guys aren't that good at writing. Tuning the new Honda Civic with a Turbocharger!! Tein USA fully customized this Honda Civic Coupe that just hit the market. The engine was fitted with a bolt-on turbo kit and the body was widened 55mm with a special body kit. Tein's newest line of suspension, the Mono Flex were installed. The ball-bearing turbocharger was still in its testing phase. The AEM fuel system and the RC550 injectors are popular components in the US. The new Toyota brand "Scion" carries a line of cars such as the xA as Toyota ist, and xB known as Toyota bB in Japan. But the tC, which is not in the Japanese market has lots of tuning parts available for it so far. This car is considered a great base for tuning. A MoTeC computer controls the combination of the 2.4-liter engine stuffed with aftermarket pistons and a HKS turbocharger. This setup produces 533 hp. The exhaust manifold seems to be made from aluminum for some reason, which will melt right away. 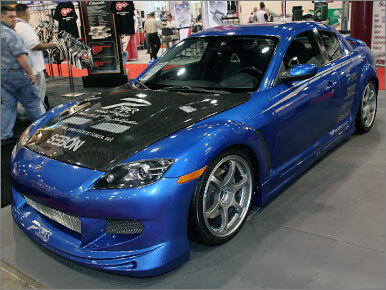 An initial release of the Supercharger Kits for the RX-8!! Power Enterprise did an initial release of their supercharger system at SEMA, and will also be premiered to the Japanese market at the 2006 Tokyo Auto Salon. The combination of the Rotary Engine and the supercharger is spectacular, and this unit is labeled at a reasonable price. The bolt-on supercharger kit pushes up over 300 hp on a stock engine. The price of the supercharger kit including an intercooler and other necessary parts starts from $4000.00 in the US market. Equipping the new Mitsubishi Eclipse with a turbo kit! Every year, Greddy releases several turbocharger and supercharger kits for the new model vehicles. This year Greddy engineered on for the new Mitsubishi Eclipse. The current model carries a 3.8-liter V6 MIVEC Engine instead of the traditional 4G63 Engine. The chrome paint job brings a mysterious aura! Carbon Fiber front end! The owner of this car works at a hospital. There are many FD3S with unique color schemes like the one from Maziora but this one amazed us all. The body is not actual chrome, but a type of paint that looks different at different angles. This NSX with a carbon fiber front bumper, fenders, and hood is owned by a single person. Even in the US, the NSX is a popular car and many tuning and dress-up parts are available. Amazing flame job on a G35! Call the fire department! Carbon fiber in the US means Seibon! ACT Clutch's G35 sports a flame job like no other. These cars are commonly seen on the streets and in Japan, it's called the Nissan V35. Seibon is one of the popular carbon fiber makers in the US. The hood, doors, and the rear hatch on this RPS13 was customized with the carbon kevlar. The cool thing is that the color of the body matches the kevlar. This machine is known as "The Flat Black Honda"! The new Civic SI Stealth was produced by SKUNK2, an well known Honda Tuner. The engine was assembled with SKUNK2 pistons, connecting rods, camshafts, and so on. This machine is setup as a time attack machine. The Mustang and the GTO drift cars! 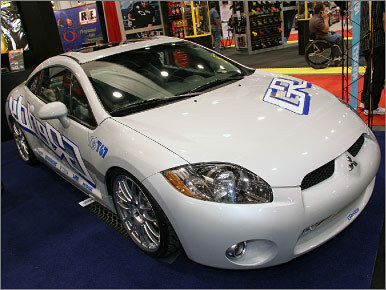 Exedy, a clutch manufacturer had the Ford Mustang and the Pontiac GTO on display which competes in the D1 Grand Prix USA series. In the US, the mustangs are very popular and many products are available. Exedy produces clutches for American cars as well. What!? A Dodge Charger 2DR Coupe!? The new Dodge Charger was on display. This orange one stood out the most. The 4 door was modified into a 2 door coupe with a "Dukes of Hazzard" paint. The removable helmet support is ideal for track and street! Have you ever sat on a full bucket seat with a helmet support? The helmet support firmly holds the helmet and supports the side G-force loads. On the other hand, it becomes a nuisance when the seat is used on the street. The new model full bucket seat with a removable helmet support was introduced. Now, a bucket seat can be used at both street and track. The electric thermostat allows water temperature management! A regular mechanical thermostat is constructed so that when the water temperature starts to rise, the thermostat gradually opens up. However, the thermostats do not react quickly to manage the engine temperature at times. Especially the tuned vehicles which run hot and cold constantly are prone to overheating. The electric thermostat allows manual operation of the thermostat to counter this problem. This is a must have item! Decorating an exhaust manifold with the color wrap!? A thermo-wrap is for shutting out the heat from an exhaust manifold. These are commonly white or yellow. These new colorful thermo-wrap have been invented o help both the resistance for heat and the exterior dress up. The new control unit to adjust the fuel pump voltage. It is necessary to upgrade or add an additional fuel pump when tuning a car. The whining noise of a high performance fuel pump annoys some people and is the most noticeable when the car is idling. The Aeromotive FPC controls the voltage for a fuel pump according to the revolution of the engine. As a result, the FPC reduces the supply voltage to the fuel pump when it requires less load like when idling. It adjusts the shocks while taking in data! There are many products which are able to adjust the shock absorbers electronically but this system stays ahead of the competition. The system allows adjustment to a very fine level while the other products use a dial to adjust. Furthermore, this product collects the data from the shocks for analyzing. This brake system gets along with any high-cam applications!! When an engine is fitted with high lift camshafts, the valve timing becomes out of spec, causing vacuum pressure drop in the entire system at times. Here, improper amount of vacuum makes the brake master cylinder work inefficiently. With the help of an electric pump, the system can be corrected back to normal. This idea was adopted from diesel powered machines.